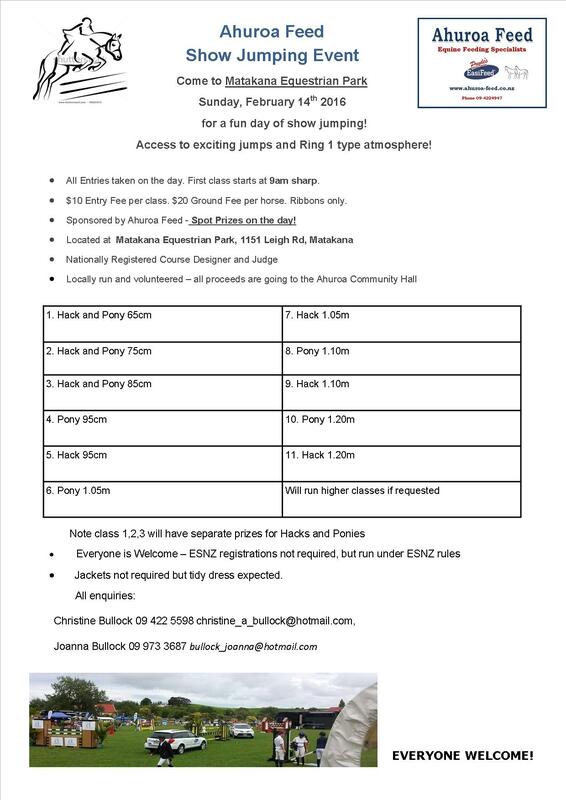 Come to Matakana Equestrian Park Sunday, February 14th 2016 for a fun day of show jumping! Access to exciting jumps and Ring 1 type atmosphere! All Entries taken on the day. First class starts at 9am sharp. $10 Entry Fee per class. $20 Ground Fee per horse. Ribbons only. Sponsored by Ahuroa Feed – Spot Prizes on the day! Jackets not required but tidy dress expected. This is a Fantastic Venue with Amazing Jumps. If you don’t Ride the Country Park is a great place to have lunch and enjoy the atmosphere. See you there Ahuroa !